Kids With Horses and Donkeys Are Special. This curriculum was first designed for a group of children who were homeschooled. It’s great, too, for Brownies, Cub Scouts, Girl Scouts, and other youth groups. It’s a 5 session course provided on the farm. Check your calendar before calling to schedule. Recommended for groups of 5-6 youngsters; up to 10 may be accommodated by special arrangement. Choose your horse or donkey (from a group of our tried and true miniatures). Beginnings of Basic Horsemanship tutorial. More Basic Horsemanship, using the student’s chosen miniature horse or donkey. 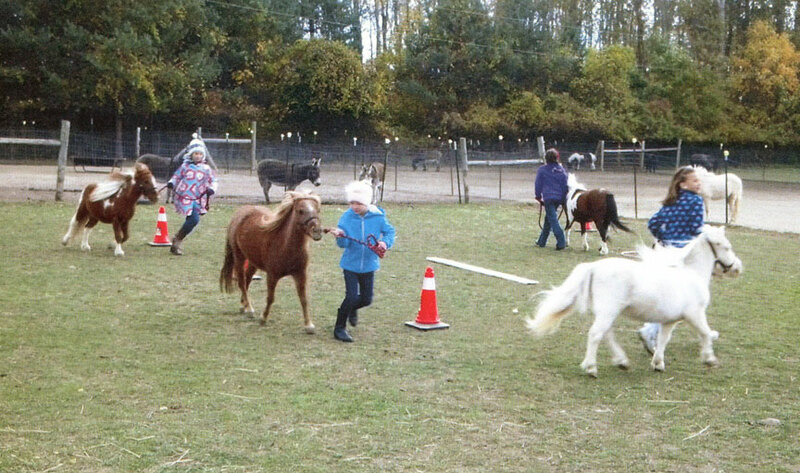 Introduction of Obstacles (all obstacle work done at the walk, using the student’s chosen miniature horse or donkey). More Obstacle work, using the student’s chosen miniature horse or donkey at both the walk and the trot. Session 5: Putting It All Together…A Fun Show (audience participation invited). “Classes” at the Fun Show pair students with their chosen miniature horse or donkey and allow each student to exhibit his or her new skills and knowledge. Games and Costumes are added to Basic Horsemanship and Obstacles. Deposit required at booking. Payment in full due no later the the first session. New curriculum developed for returning students incorporates students’ special natural horsemanship interests.